One of my earliest gaming memories was playing the officially licensed Sega port of Konami's Frogger for the Dragon 32k computer. The game has been cloned and reinvented to various levels of success in the three decades that have followed, which is a testament to the addictive nature of its core gameplay. ​While it would have been an easy thing for Sachen to simply make a game about a frog trying to cross a busy road then feed the details into their universal translation device and name it Croaking Pathway or something, you have to respect that despite still choosing an unintentionally odd name, they have actually tried to make a game that doesn't just clone Frogger, but takes its core gameplay and evolves it. 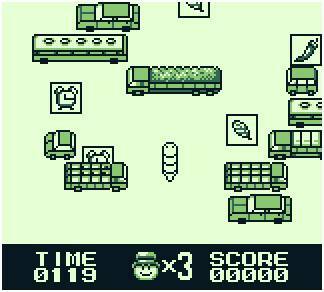 Familiar Frogger-like roads and streams for the early levels before the game move into more original puzzle territory and also make good use of the Mega-Duck's 'dual layer' transparency feature. While the worm can inch carefully sideways he moves two spaces vertically which shakes up the core gameplay of Frogger by forcing tactical thinking and the occasional retreat. Cute little cut-scenes perforate each stage. Although the same four or five eventually loop, they are nicely drawn. 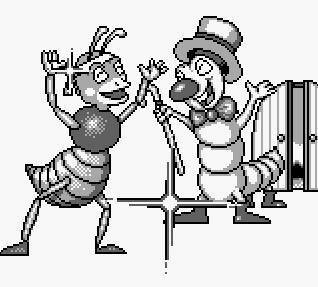 Here the Worm visits one of the Ant Soldiers in what we like to think is solid evidence of a Sachen expanded universe! ​While the game opens to the familiar roads and streams of its major influence, the sprite chosen for the job presents an immediate shift in gameplay. While your worm initially looks like little more than a single spaced blob, moving him sees his body creep out and triple in size before settling back again and most players will probably die in the first few seconds, lunging, inadvertently into traffic due to misjudging this. While the worm can creep one space at a time when moving left or right, moving up or down sees him move twice the distance. This makes inching your way steadily forward through the baddies, as you would have done in Frogger, much more difficult, if not sometimes impossible. On water based stages, it's not just a case of waiting for logs to align but looking across the water to see what you can hop over to. The option to take these lunges is also available for sideways movement, but the d-pad relies on pressure sensitive touch to gauge the distance you want to cover. What this all essentially adds up to is that it won't always be possible to just keep moving forward and there will be tense moments where creeping sideways in line with traffic meet sudden lunges backwards as a space opens up. 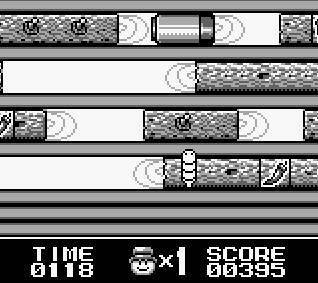 The levels themselves are much bigger than Frogger, scrolling several screens before the end goal appears (thankfully just one big strip as opposed to the original's precise targets). Aside from the familiar traffic and crocodile infested streams of Frogger, you'll also traverse dangerous factories, mines and other less familiar territory. While most of the power-ups are merely for points (as well as oddly designed - feathers and chilli Peppers? ), there is also a clock that freezes the action and can be essential at time. ​Graphically the game does a beautiful job, the levels themselves are clean and easy to make out and punctuated with nicely drawn, if repetitive, little static cut-scenes of the worm visiting his various insect buddies. The game is also one of the few Mega Duck titles to make use of the system's "dual layer" technology to produce some nice transparency and parallax scrolling on later stages. Musically, the game is also nicely varied, with four or five different tunes playing and alternating each time you reach a new stage. There are thirty stages in all and, thankfully, initial concerns about looping are proven to be incorrect with the levels instead simply re-using earlier themes, but increasing in fiendishness as you progress. You are given a stock of 9 continues with which to attempt the challenge and this sets a fair and even challenge for the player. 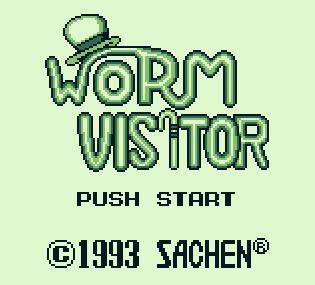 Worm Visitor plays like a great evolution of Frogger and is definitely something of an old-school hidden gem for the Mega Duck. Like ﻿Snake Roy﻿ it has taken a lot of ridicule for its odd name over the years but it's actually a polished title filled with excellent and addictive old-school fun and nicely polished with graphical and musical flourishes. ​If you're planning on collecting for the Mega Duck then you should definitely pay the little top-hatted fellow a visit.